Lighting the lamp is the hardest thing to do in all of hockey, and scoring is down yet again in the NHL. But instead of talking about ways to make goalies worse, by reducing the size of their equipment or by limiting what they can do on the ice, let’s look at a few habits shooters can acquire to shift the odds in their favor. While the statistics and research behind the information presented here come from the NHL and CIS levels, I’m confident that any player – from Peewee to Beer League – can put them to good use in 2016. I’ve already written about scoring in the shootout, so here are four scientifically sound tips for scoring more in open play. Luca Sbisa may be one of the players who best epitomizes the divide between the old-school, eye test view on hockey and the statistics-focussed analysts offering their opinions from their mother’s basements on fan curated sites across the internet. While GM Jim Benning clearly thinks Sbisa is a useful defender, rewarding him with a 3-year, 10.8MM deal, and consistently praising his defensive zone smarts, Canucks fans have been less bullish on the talents of the 25-year-old Swiss pointman. Correctly noting his less than stellar possession numbers, J.D. Burke commented that his first season with Vancouver featured few “extended stretches in which any pairing with Sbisa on it looked passable”. These aren’t just the criticisms of a bitter fan wishful for better years, Burke backed up his arguments with a detailed numerical breakdown of Sbisa’s many failings, and video evidence of some of his less than professional defending from 2014-2015. Burke, and the Canucks’ fanbase in general, seemed to paint a picture of Sbisa that stands in stark contrast to what Vancouver management observed. Where the fans saw a player who frequently found himself out of position at critical junctures when defending his own end, Vancouver’s brain trust viewed Sbisa as the ideal player to disrupt a cycle down low. How could two groups of people who watched the same games with such intense devotion come to such different conclusions? One of the biggest difficulties with evaluating Sbisa, and defencemen in general, is that what the eye test says is important is often wildly out of sync with what statistics can currently measure. While stats-based analyses focus on a defender’s ability to prevent shot attempts (in other words, their Corsi Against per 60), most of the praise for defensively-minded defencemen tends to focus on hockey IQ, being in the right position, and winning battles in the corner. While ideally these less “quantifiable” skills should lead to favourable statistical results, issues with differences in player deployment and the teammate-dependent nature of defending often mean that what gets praised in post-game interviews isn’t what shows up on the scoresheets, leaving a divide between management’s view and the story told by pure shot attempt numbers. Practical Concerns: Can Accuracy Be Coached? A few weeks ago, I was playing in a weekly beer league hockey game with some McGill University staff members. At one point, I came down the left wing with the puck, looked off a defender and whipped a wrist shot high, far side. It was a light-hearted chirp – we weren’t playing for the Stanley Cup, after all. But it got me thinking about coaches who yell up and down the hall when their teams don’t “put the puck on net.” Is it really something that some teams do better than others? 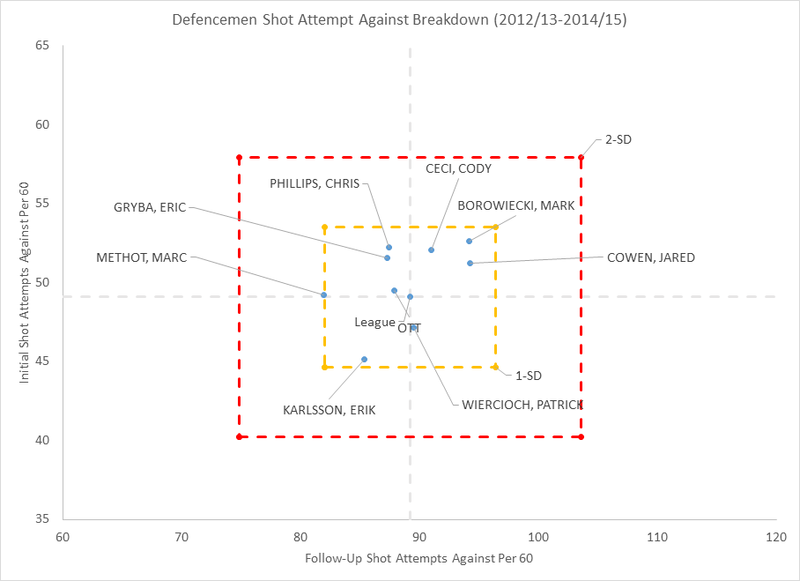 Jacob Voracek is having an especially poor season. After averaging above 1.6 Primary Points per 60 at 5v5 the last few seasons, he’s down to .6 in 2015-16. Voracek’s assist rate is down, and most prominently, he has only scored one goal at 5v5. What is causing this run of poor form? The most direct route of analysis is to examine his shot metrics. How does Voracek’s 2015-16 season stack up against his previous seasons? This week, I wanted to illustrate several ways that passing data can be used to more accurately assess players, offer examples of advance scouting and opposition analysis, and identify how and where teams attack and defend. On Monday, I gave you the basics for passing data. Tuesday saw a deeper look at network and linkup data. Wednesday introduce lane Corsi concepts. Yesterday, I combined most of this to illustrate how it could be used to prepare for an opponent. Today is much lighter. Today is about releasing our data to the community. Enjoy! This week, I’ve introduced some of our latest and newest data and metrics. On Monday, I posted a refresher on what passing metrics were and why they were important. Tuesday had network and linkup data that really only scratches the surface on what we can do this season. Yesterday, I introduced lane Corsi concepts and how they might reveal a bit more information when examining how teams generate offense and defend against the opposition. Today’s post is rather ambitious in that I will take all the different ways of using this data, synthesize it into an advance analysis of the opposition, and then provide the data of the game in question to see how things matched up. We’ve had a Toronto focus all week, so that will continue. The opposition will be the New Jersey Devils and we’ll focus on their clash from December 8th. This will be done under the hypothetical assumption Toronto’s opposition analysts have access to this type of information league-wide and how they could make use of it. All data is 5v5 unless otherwise stated. Leafs data is from 13 of their first 26 games in aggregate; Devils data is from their first 21 games. So far this week I’ve introduced some of our newer metrics using our data on the Toronto Maple Leafs. 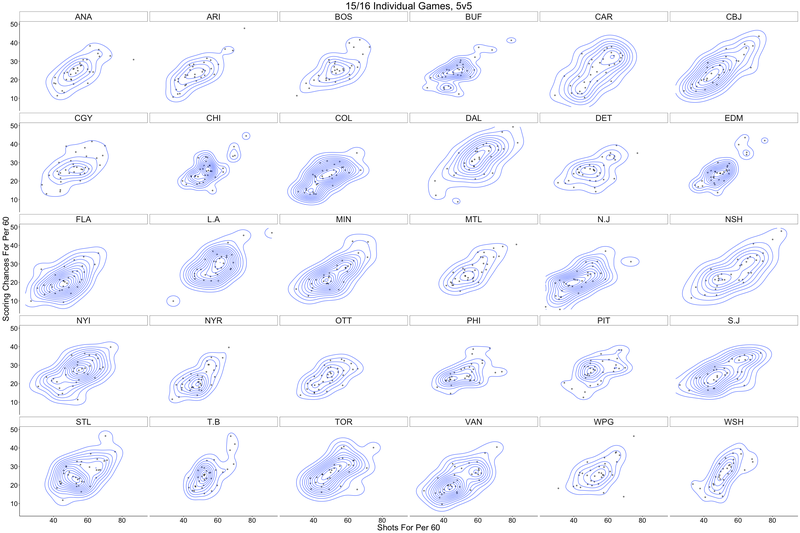 We’ve looked at general shot contribution and on-ice data as well as network and linkup data. Today ,we’re going to look at something new that may help us understand more about how teams generate offense and where teams fail to defend the opposition. Understanding where the offense originates while preparing for a specific opponent can provide great value. If I know which lane and zone a player is likely to linkup with another, perhaps I can scheme for such a situation. If a LW-LD combination is getting overrun down their side of the ice, yet the LD has decent left lane numbers apart from that LW and the LW’s terrible numbers persist irrespective of who is behind him, I know there’s either a communication breakdown between those players, or that the LW is more likely being propped up by the LD. Digging deeper into how the game can be analyzed with new data is the first step in how we’re going to answer some of these questions. All data is 5v5 unless otherwise specified, and is through games completed as of 12/4. This represents 13 of the Leafs first 26 games this season. Nazem Kadri has been the name on the tongues of most Toronto Maple Leafs fans for many reasons. It could be due to his slow start, where at the time of this writing he currently ranks 324th of forwards in points per sixty minutes. However, thanks to the words of Mike Babcock, Kadri’s efforts have not gone unnoticed. In fact, Babcock is quoted as saying, in reference to Kadri, “He is in on all the chances, he generates a ton.” After Babock’s words and this piece on Kadri and his chances, it’s apparent the goals will come and his slump is simply a natural byproduct of this chaotic sport. Well, in addition to some of our newer data and metrics, let’s take a look at how and where Kadri generates chances for his teammates, shall we? All data is 5v5 unless otherwise specified, and is through games completed as of 12/4.